"The Purple Paisley Brunch - NY Pajama Edition" with Jerome & Wally! "The Purple Paisley Brunch - The NY Pajama Edition"
With Jerome Benton and featuring Wally Safford ("Sign O The Times", "LoveSexy", Prince classic song "Wally"). Enjoy our unlimited brunch buffet and a drink menu of bottomless Mimosas, Bellinis, and Sangria. All DJ Set featuring DJ Kool K. Gee & Special Guest Appearances! Come out rocking your best lounge wear and enjoy the music of Prince & The Minneapolis Sound! Sunday, September 23, 2018 from 1pm until 6pm. Taj Lounge (48 West 21st Street between 5th and 6th Avenues) in New York City). Must be 21 & Older to Attend. Tickets on sale now on Eventbrite & Event Info on "The Purple Paisley Brunch"
The 1ST GLOW TELEVISION & WEBSERIES FESTIVAL and GLOW AWARDS CEREMONY will be tapped LIVE all day Saturday , August 11, 2018, GLOWFEST+ will be honoring our special guest panelists and Mikaila Ulmer. The one-hour pre-show airs on Instagram live from the red carpet at 9am/10am PST. The 1st GLOW Television & Webseries Festival and GLOW Awards Ceremony will take place on Saturday, August 11th at The Los Angeles Film School. The GLOWFEST+ celebrates the accomplishments and creativity of women, diversity and LGBTQ in the fields of television, music, technology and film, and also honors individuals or groups who promote social justice through creative endeavors. Hosted by The Bobby Brown Story Issac Sullivan. January 25, 2018 - For the very first time in over 30 years all 5 original members of The Family (now known as fDeluxe) will reunite in Minneapolis on for 2 not to be missed shows at The Dakota on January 31, 2018. Jellybean Johnson, Jerome Benton and “St Paul” Peterson (all members of The Time during the ‘Purple Rain’ era), Eric Leeds (Madhouse, Prince & The Revolution, LP Music) and Susannah Melvoin, twin sister of Revolution guitarist Wendy have not performed together in Minneapolis since their now legendary, debut performance at First Avenue on August 13, 1985. Formed by Prince in 1984, The Family’s debut, self titled set (released on Paisley Park Records, and featured the original recording of ‘Nothing Compares 2 U’) has been cited as an all-time favourite by artists such as Dam-Funk, Questlove, Chris Rock, Erykah Badu and D’Angelo to name but a few. Expect cult classics such as ‘Screams Of Passion’, ‘Mutiny’ and ‘High Fashion’ along with latter day fDeluxe material to be performed by the band during their 7pm and 930pm shows. The band are extremely excited about having Jerome Benton join them during what is a very special time for Minnesotans. Actor and Musician Benton is an American Icon with a celebrated history of 30 over years of success in music and Hollywood. A Minneapolis, Minnesota native, Jerome became a star as part of The Time where he created the role of show “hypeman” which now is standard in many genres of music. His acting career began in 1984 with his pivotal role in the iconic film ‘Purple Rain’ followed by a lead role alongside Prince in the black and white cinematic feature ‘Under The Cherry Moon’. In recent times he has been responsible for the independently written, produced & assistant directed stage play ‘Love Makes No Sense’starring Alexander O'Neal and Cherrelle, followed by a second stage project ‘I Want To Go To Heaven’. Jerome rejoined The Time in 2008 for a series of special concerts & was featured on the 2011 album release ‘Condensate’. He recently formed Thandiwe Entertainment Architects with writing partner Ilunga Adell. Since resuming their recording career in 2010 as fDeluxe (minus Benton) has released the critically acclaimed studio albums ‘Gaslight’ and ‘AM Static’ along with a blistering concert set ‘Live & Tight As A Funk Fiend’s Fix’. They have performed sold out shows in Australia, Japan, England, France, Belgium and Amsterdam as well as in the native USA. Their performance at an all-star (D’Angelo, Chris Rock, Elvis Costello and more) tribute to Prince at Carnegie Hall in 2013 saw Billboard proclaim, “the show reached its funkiest echelon when fDeluxe came out to perform with the Roots,” while Village Voice described it as "a dominant appearance by fDeluxe whose high energy funk set was otherwise a master class in bass-driven grooves." In addition to 7pm and 930pm shows at The Dakota on 31 January fDeluxe will be performing a 30 minute set on the Verizon Up Stage at Super Bowl LIVE at 545pm on Thursday 1 February. Tickets to the Dakota show or the VIP Experience and Minneapolis Sound After Show Party featuring DJ Lenka Paris can be purchased on-line at www.dakotacooks.com or by calling 612-332-5299. Grown Folks Music Exclusive Interview!! I was invited by De Angela Duff with New York University at the Brooklyn Experimental Media Center #I<3DM. Professor Duff in the House! Enjoy this special rare interview with Grown Folks Music! THANK YOU NEW YORK & Katra Lounge!!! We Did it Big in the Big Apple For My Birthday!!! I am so thankful to all the Fans, Family & Friends that came through to Katra Lounge. Thank you to everyone that traveled across country to come and celebrate my special day with me. From the bottom of my heart I thank you and show my appreciation to you. Thank you Kim & Randy (you both already know!) Thank you to my Team Tonya & Jill with Pose Management for making the event a success. Thank you Clint Laourdakis with Mad Angry Panda Designs for your cool (did I mention C.O.O.L) design work of the Umbrella and t-shirts. Thank you Troy Gua and Jonathan Caustrita for your illustrations. 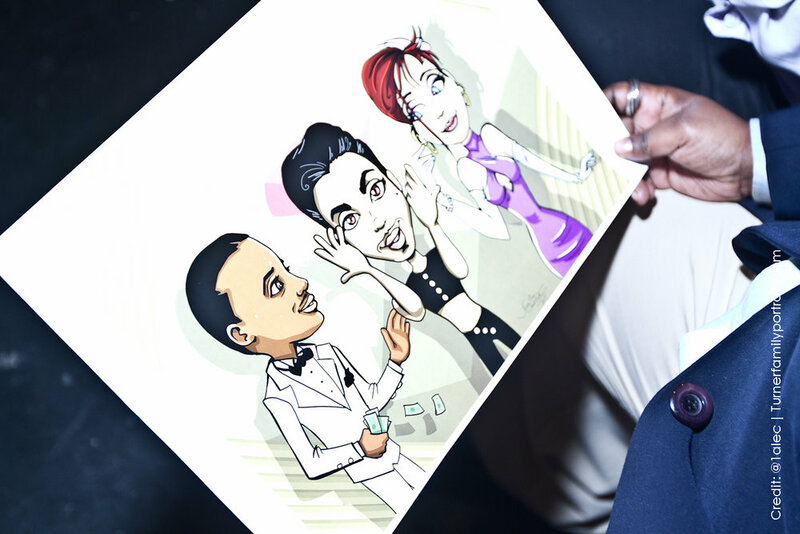 Tricky & Christopher never looked so good in cartoon form!!! Thank you Miles Marshall Lewis, Crystal Durant & Ron Worthy. An event is made successfully when you have talented people like this giving their best. Special thank you to the photographers & filming crew that captured some AMAZING clips. Kevin Brown, Daniel Ivy Jr., Alec Turner & Barry Bcyd. And you know I gotta give a shout out to DJ Kool KGee. He had the deep crates....he had the deep crates. Katra Lounge & Staff - superb food, service and "drinky drinks!" What can I say? NYC lets do it again!!! HAPPY BIRTHDAY JEROME - Party in NYC at Katra Lounge!!! My birthday party will be at Katra Lounge. in NYC! DJ Kool KGee on the 1's & 2's with a special fan Q&A with writer Miles Marshall Lewis (Ebony Magazine, Essence Magazine). Celeb guests, media & filming all night! Rock your best Purple as we pick the Best Dressed for the night with special prizes! Co-Hosts for the night include DJ Crystal Clear & Tonya Giddens! Come Enjoy New York Fashion Week & Celebrate the Legacy of Prince on Wednesday, September 13, 2017! CLICK HERE TO GET YOUR TICKETS ON EVENTBRITE NOW!!! Evenovate and New Day Entertainment in conjunction with Radio One (Detroit’s Hot 107.5 and 105.9 KISS-FM) present The Purple Party: a birthday celebration for my friend & brother the iconic Prince. The event takes place at Bert’s Warehouse Theater in Detroit, MI. The Purple Party is the ultimate Prince tribute and birthday celebration in the Motor City. Prince themed cocktails and free commemorative t-shirts will be given with a VIP purchase. Limited early bird tickets are on sale for $19.99 and can be purchased online at www.ticketalternative.com or by calling 877.725.8849. Before the event there will be a Purple Rain Block Party hosted by KISS 105.9’s Angie Starr which is free and open to the public. #PurpleArmy I'm bringing my sister Jill Jones and my brother Wally with me. It's a party to celebrate Prince and Detroit! Jerome, along with business partner Ilunga Adell, will be visiting Chicago on October 7 & 8 to support Chicago Theater. Jerome and Ilunga share co-ownership of LA based production company Thandiwe Entertainment Architects. Don't miss out on this event! Thank you to Cheryl Boone Isaacs and The Academy for the invitation to appear on the panel for "Purple Rain." For those in attendance it was incredible to celebrate a historical moment in music and film. Much love to Jill, Marie, Bob, Albert, Reggie & Marcus. And always thank you to my brother Prince for the opportunity. Costume designer Marie France, producer Robert Cavallo, director Albert Magnoli, actors Apollonia Kotero and Jill Jones, and actor/The Time musician Jerome Benton at the Academy Event "Purple Rain" on August 29, 2016 at the Samuel Goldwyn Theater. Jerome, along with Director Albert Magnoli will lead a discussion about the significance of Purple Rain & the lasting legacy of this iconic film. Fans Get Your Tickets now!